A Vegan Energy Bar that’s also good for Your Heart! Finally, an energy bar that I can feel good recommending to my loyal readers! I am always on the lookout for food options that are not only good but that are good for you. 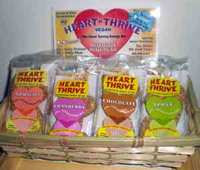 And the Heart Thrive Cakes fit the bill. This is a great energy bar that is perfect for anyone who is concerned about their health and looking to add whole grains to their diet for a yummy, low fat and high-fiber snack. These healthy cakes offer the ideal balance of protein, carbohydrates and fat – and they help prevent the quick rise in blood sugar that can end up making you feel hungry faster with other bars. (That makes them just what the doctor ordered for diabetics, too, by the way). One reason that I’m particularly drawn to Heart Thrive Cakes, other than the fact that they taste so good, is that their number one ingredient – oats – is the first food that the FDA has allowed to be attached to health claims. Yep, the FDA says that oats, as part of a diet low in saturated fat and cholesterol, may reduce the risk of heart disease. 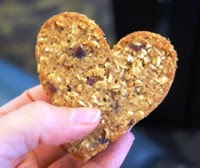 So, since Heart Thrive Cakes are both free from cholesterol and abundant in oats – they make the best snack for those who are concerned with heart health (as we all should be). Each Heart Thrive Bar provides you with thirty percent of your total RDA for fiber, protein and calcium (contains as much calcium as an eight-ounce glass of milk). They contain no trans-fats, no cholesterol, no wheat, and no GMO. For those on an all vegan diet, this is a wonderful and tasty way to get your protein in each day. And these cakes are made from ingredients with a low glycemic index that allows them to metabolize slowly, which keeps you feeling full longer – and that helps you sustain your energy for a longer period of time. There are currently seven flavors of Heart Thrive Cakes, including raisin, chocolate chip, date, apple, poppy seed (my personal favorite! ), cranberry, and apricot. And they are made with all-natural, vegan ingredients, including oats, soy, dried fruit, natural fruit juices, and sweetened with brown rice syrup. Each bar has less than 167 calories, and most are merely 2 weight watchers points. I buy mine at Whole Foods but I've seen them at other natural food stores as well. You can also purchase them online directly from heart thrive. I just learned about these today. They are filling and tasty and how can you go wrong with 2 ww points for a healthy snack!